Ruben feels like he is the only kid without a bike. His friend Sergio reminds him that his birthday is coming, but Ruben knows his family can’t afford that. So when Ruben sees a dollar bill fall out of someone’s purse, he picks it up and puts it in his pocket. 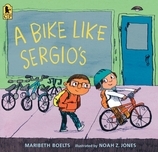 But when he gets home, he discovers it’s not one dollar or even five or ten — it’s a hundred-dollar bill, more than enough for a new bike just like Sergio’s! Finders keepers, right? Presenting a relatable story with subtlety and heart, the creative team behind Those Shoes pairs up again for a story about how hard it can be to do the right thing. 40 / 10 1/4" x 9 13/16"